Just before our kids headed back to school, my wife and I took a trip we’d been meaning to for a while now. We went to Iceland. The tiny island in the North Atlantic is the farthest Western nation in Europe, sits just south of the Arctic circle, and features a staggering amount of beautiful landscapes, adorable wildlife (puffins! ), and amazing food. In the week we were there, we snowmobiled on a glacier used on “Game of Thrones,” snorkeled between two continental plates, and hiked across gorgeous mountains. It’s a magical country. Nowhere was that more evident than while bubbling away in a bath of beer. That’s right, I said a bath of beer, because when I was in Iceland, I went to a beer spa! In the northern part of Iceland, not far from Akureyri, lies The Beer Spa. It’s in a building that looks like a trendy restaurant, in the midst of a small port town on the coast of the Arctic Ocean. The Beer Spa is perhaps the oddest application for beer you’ll ever encounter. Most people love to drink beer, and some people even like to cook with it, but have you ever thought about soaking in a big tub of the stuff? Well, these Icelandic folks did, and in 2017, they opened The Beer Spa. I’ll be honest, even as a huge fan of beer, it’s an odd thing to see a giant tub of warm, bubbling beer and think, “Hey, I’m going to climb in that!” The beer in the bath hasn’t reached the alcoholic stage of fermentation yet, but it does have hops added for their beneficial purposes. They also say their hops “are proven to have soothing and relaxing effect on muscles and body,” are “rich of antioxidants and alpha acids,” and that the “oils and minerals from the plant have anti-inflammatory effect to the skin and is also used to decrease the surface blood vessels.” See, beer is good for you! Luckily, since this beer isn’t drinkable (I’m not sure I’d want to drink the beer I’m soaking in anyway), the spa provides a tap with all the beer you can drink while you enjoy your tub time. 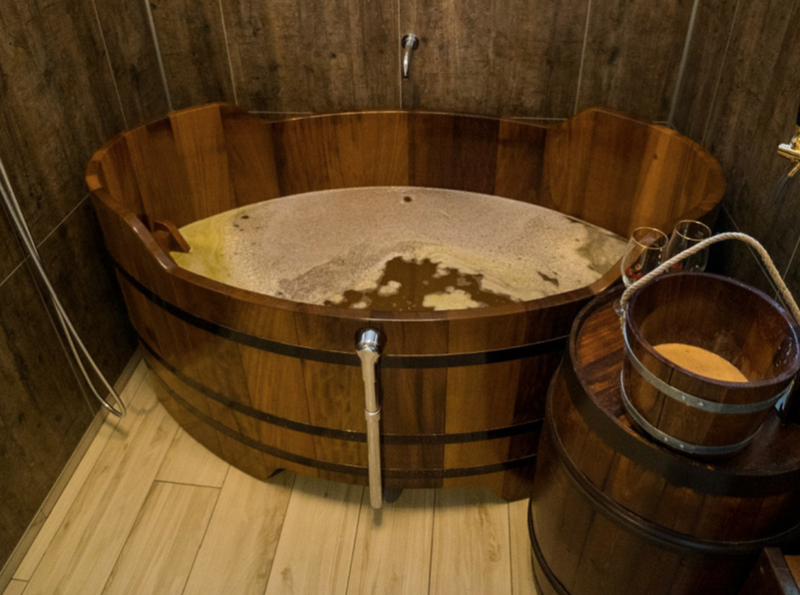 After your half-hour in the tub, you’re escorted up a set of stairs to a quiet room where you relax for a while and let the nutrients from the beer soak into your skin. With a few beers on board, a dark room, and having just finished a long day of Icelandic horseback riding, I dozed off. Then you head back to the locker room and get re-dressed for the Icelandic “summer,” which means wearing a light sweater, long pants, wool socks, and hiking boots.